A product that I have been using for well over a month now, the Creative Fatal1ty USB Headset is great for the low $30 price (Newegg). 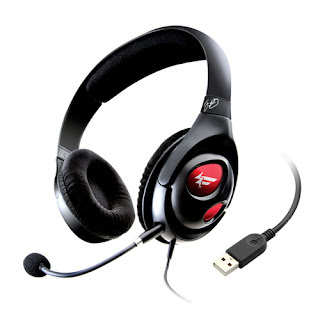 They have good sound quality and are generally quite comfortable. Not only this, but this headset looks pretty cool too. So first of all, lets talk about the most important thing in a headset: the sound quality. I have always liked Creative for their sound quality to price ratio. I have always been satisfied with the quality in this headset, even when making some music. The bass and treble levels are exceptional, not DJ quality, but for $30 they are very good. The quality of the microphone is also very good, I guess you all will experience it once the vodcast is up an running. These are generally comfortable to wear. In fact they are barely noticeable. However, after having them on for hours and then removing them, there is a noticeably strange difference for a minute or two. It doesn't hurt, but it does make your ears feel... weird. It isn't really a bad thing, and certainly shouldn't be enough to make you decide not to get this headset. The last thing is that these are by no means noise cancelling headphones. They actually let sound out, even when they are on. This isn't a bad thing necessarily, it just does this much more and louder than expected. The headset comes with a very nice carrying case that has a separate pocket for the detachable mic. So all in all, for $30 from Newegg, this is probably the best you can do for that low price.